Oromo is among the most widespread African languages. It is spoken by approximately 30 million speakers in Ethiopia, Kenya and Somalia. 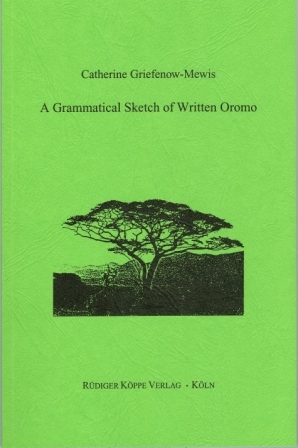 The grammatical sketch offers an overview of Oromo’s grammatical structure. In the first chapter phonology is dealt with. The author lays the main emphasis on the elaborated nominal and verbal morphology, which is considered in detail in chapter 2. The syntactical structure is the topic of the last chapter. The information is arranged in numerous charts and tables to facilitate understanding for the reader. The book is primarily meant for students of Oromo, but it is also useful for researchers who want to get an insight into the structure of Oromo. The grammatical sketch supplements the Oromo coursebook and exercise book written by the same author.